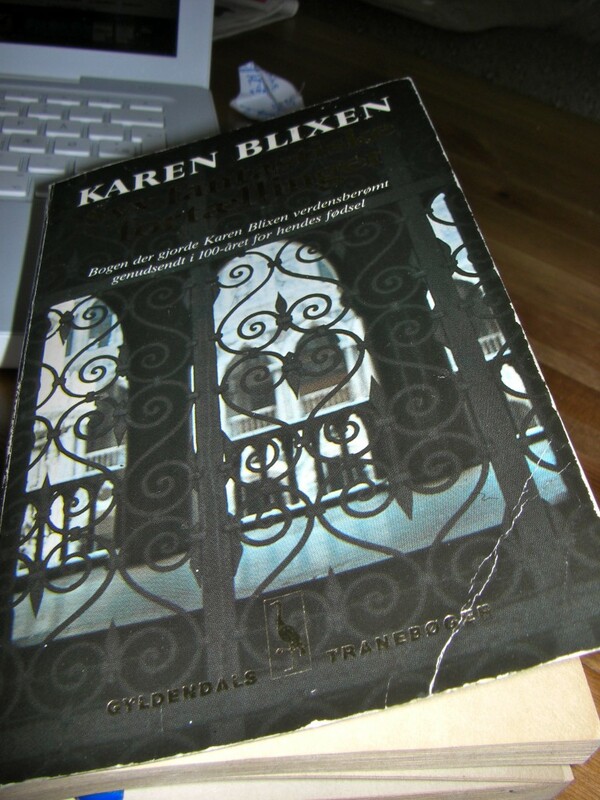 I have started to read Karen Blixen’s Seven Gothic Tales and I am really liking it. The first story ‘Roads around Pisa’ reminded me a lot of Don Quixote and how Cervantes playfully deals with sexuality and misconceptions that invite a reconsideration/reaffirmation of the cultural meaning of gender. There is an awful lot of reflection about women and their stand in life in Blixen’s tales. It is really fascinating to read when most of it narrates through the characters of men, and that which is narrated by women is done with regards to their station within the realms of society’s norm. The seven tales from the title are interspersed with many, many tales that use this power of narration to get their story out. I am a firm believer in the idea that we sculpt our world through narration. The stories we choose to tell are our takes on reality as we perceive it, or in some cases how we challenge it. We accept and join in on some narrations, while we reject and replace others and in doing so we create meaning for ourselves. The characters of Karen Blixen are all trying to communicate their knowledge or view of the world through their tales. There are those in her character-base who create stories that are double-edged, recounting past experiences with present knowledge (older, wiser attitude) while forming their explanation by present outlook. And then there are stories that attempt to incite future action, stories that distress, stories that bring joy and stories that contemplate life’s fickle nature. Narration has a great power over humans. We relate to each other when we tell tales and listen to stories of others. We invite others to see what we see and use stories to understand others, and mostly ourselves. Telling stories is a very common pastime in my family (both immediate and extended). There are some great storytellers among them that capture their audience with exhilarating stories, and it is of no matter how often we have heard them. It is not so much the story per se, as the setting, the way the story is being told and the feelings that the storytellers convey that have an effect on the listener. Without being told to ‘laugh here’, ‘cry here’, or ‘be shocked here’ you use all of your sociocultural learned skills on picking up signs and identifiable markers. I guess this inclination towards stories and narration in my family has been naturally conveyed into the wonderful world of literature for me. I feel at home in processing stories and using my skills to look at a text not as an inanimate object that is merely to be read or seen, but a living creation always up for interpretation and always experienced by the next listener/reader in line. I couldn’t agree more on your point of views. Karen was one of the greatest story tellers and I miss that kind. Great post!!! Thank you, I’m so glad you think so. And yes, she truly is a Great One.